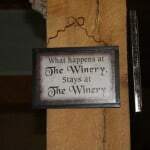 Have you ever gone to a winery and taken advantage of their wine tasting? I’ve been to a few summer wine tasting festivals where they have bands, food, arts & crafts, and lots of people. But never have actually gone to the winery for the sole purpose of sampling and learning about the wines. 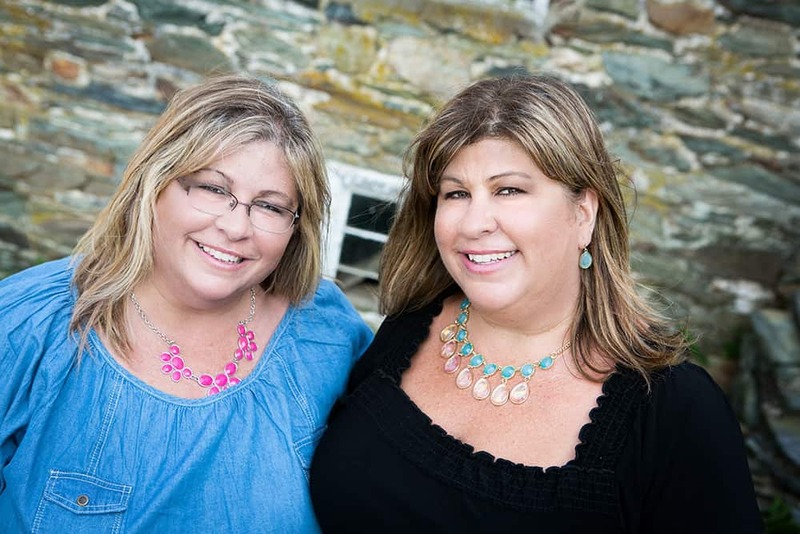 Since Linganore Winecellars is a Frederick County Winery, Terri and I thought this would be a great place to go to check out their wine tastings! Then we could feature it right here at Housewives of Frederick County. 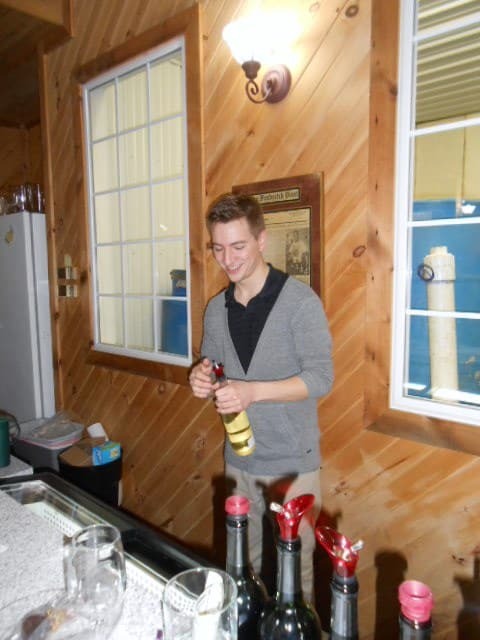 If you check out Linganore Winecellars’ site, you will find that they have monthly wine tasting events. The event for the month of January is their ‘Winter, Wine, and Chocolate’ Event. Who doesn’t like wine and chocolate? 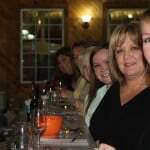 It is recommended that you make a reservation if you have a group of more than 7 people. On the day of our outing, we gathered up a group of 7 women, including Terri and myself, and headed out to Mt. Airy, Maryland. We decided to do lunch beforehand so we wouldn’t be drinking wine on an empty stomach. We chose to eat at the Mt. Airy Inn. This place is very quaint. It has 2 floors. The first floor has a bar with big screen TV’s and a nice dining area. The upstairs has additional seating for diners. The food was great and the atmosphere enjoyable. After lunch, we headed out to the winery, which was about 6 miles from the Mt. Airy Inn. We got there and immediately saw a huge bus sitting outside of the winery with a sign on it saying ‘Bridal Party’. That was our first clue that it would be a little crowded. We got inside and told the girl at the cash register that we were there for their free winery tour at 2:00. 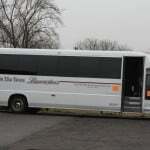 Unfortunately, they were understaffed and could not do the tour. The next tour was scheduled for 4:00, but since we were there on a Sunday, we all decided just to do the wine pairing and not wait for the tour. The cost of our ‘Winter, Wine, and Chocolate’ Event was $10 per person. 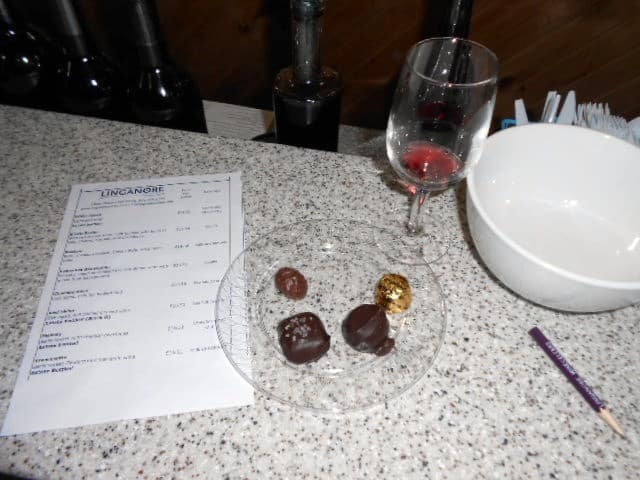 This included 16 wine tastings paired with a selection of fine chocolates from Wockenfuss Candies. We bellied up to the bar and our wine pourer explained the process. We each had a small sheet of paper, a pencil to use so we could check off our favorites, a dish of our assorted chocolates, and a bowl to use. The bowl was used whenever we wanted to rinse out our glass before drinking the next wine sample. The sheet of paper listed, front and back, the 16 types of wine that we would taste, along with a description of the wine, which chocolate to eat after each wine sample, and whether or not it was an estate wine. I asked our wine pourer what it meant if it said estate wine. He informed us that it meant that the grapes in that particular wine were solely from Linangore Winecellars. If it didn’t list that it was an estate wine, it meant that they used grapes imported from elsewhere, in addition to their own grapes. 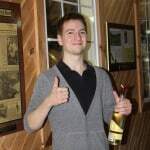 I am by no means a wine connoisseur, but I found out quickly that I prefer white wines over red wines, and I tend to like the sweeter wines over the dry wines. 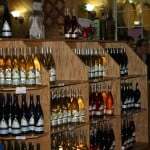 Linganore offers a total of 30 different types of wine – 3 dry white wines, 6 dry red wines, 6 sweet white wines, 5 sweet red wines, and 10 fruit wines. After our wine pairing was complete, which took about 45 minutes, we all decided to do our ‘shopping’ and choose some wines to bring home. 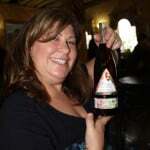 I chose 3 bottles – Mountain White, a sweet white wine, Skipjack, another sweet white wine, and Blackberry, a sweet fruit wine. The bars for the wine tastings are in the same room as the store where you buy the wines and also includes tables. Our group bought a bottle of the Blackberry wine from their refrigerated section so that we could all sit down and enjoy a bottle together. 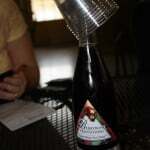 The winery provided us the plastic cups and opened the bottle for us. 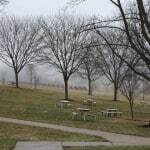 They have outdoor seating as well, but it was a pretty dreary, drizzly day, so we opted to stay inside. We noticed that the table of ladies beside us brought with them a wheel of brie cheese with fruit and crackers. What a great idea – mental note for next time. Although, they do also sell some snacky types of food in their refrigerated section, it’s nice that you can bring in your own food. It was a great little outing and something different to do on a Sunday afternoon. These wine events can be scheduled any day of the week. Their hours are 10am to 5pm Monday through Friday, 10am to 6pm Saturday, and 12pm to 5pm Sunday. 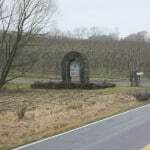 So if you’re looking for something fun and different to do, check out Linganore Winecellars. It’s a beautiful place to go. And remember, what happens at the winery, stays at the winery. Like when I accidentally poured red wine on my good friend’s pants!! Actually that didn’t stay at the winery, but she got the stain out!